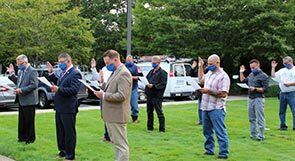 On January 1, 1997, the United Association of Journeymen and Apprentices of the Plumbing and Pipefitting Industry of the United States and Canada consolidated four locals from Rhode Island and Southeastern Massachusetts to create Local Union 51. We draw our proud heritage from Plumbers Local Union 28 of Providence, Rhode Island; Plumbers and Pipefitters Local Union 77 of New Bedford, Massachusetts; Plumbers and Pipefitters Local Union 276 of Brockton, Massachusetts and Steam Fitters Local Union 476 of Providence, Rhode Island. We serve a geographic area consisting of 39 cities and towns in the State of Rhode Island and 68 cities and towns in the Commonwealth of Massachusetts. Our membership totals 1,286 plumbers, pipefitters and refrigeration technicians.